The clipping path service supports graphic designers and publishing companies as well can online ecommerce shops and businesses requiring clipping path service. This is beneficial when there are huge quantities of images which need editing. It is far more economical to have this work outsourced rather than involving expensive graphic designers. After the photo clipping path process is complete the photo background can be flawlessly removed and either left transparent (without a background) or can be placed in a different background. When a project requires a speedy turnaround Photo Clipping UK can return the clipped & edited image files as quickly as 24 hours depending on clients requirements. Work directly with us by email, phone and online chat support as we process your images. Many graphic designers and website designers are now outsourcing the time consuming aspects of projects to Photo Clipping UK. This includes such as adding a clipping path to remove the background of a photo and preparing the photo for using in catalogues and e-commerce websites. A very time consuming activity is cutting the background from photos for brochures or e-commerce websites. We use several techniques including vector clipping masks, magic photo background tool and sometimes just manually removing backgrounds from the main subject of a photo. Contact us for a photo clipping quotation. We will create a PSD original file or a flatten image format such as JPEG with a white background or PNG with transparent background to the photo subject. We can leave the image with the vector cliping path on the subject. If you have any questions about our photo clipping path service please feel free to contact us. Using a vector clipping path service allows for an image to be removed from its original background so that it can be embedded into another background or be used without a background. After the photo clipping path process is complete, photo background can be flawlessly removed. The image can now be left without a background or can be placed in a different background. It is often a burden to designers to process a heavy load of images losing focus for creativity while merely conducting image editing. Outsourcing this basic image editing task to Photo Clipping UK provides a cost-effective solution for fast processing. Companies selling products often require the background to be removed from photos to be able to add these to their website or catalogue and ensure professionalism. Our service provides the cost-effective solutions for removing the background by adding an image clipping path on a large quantity of photos. Once a product has been removed from it's background the often item needs to have a some shadow adding to make it look natural and finished as well as small modifications to improve clarity, blemishes or to remove logos. Our service can include editing of an image. Several photos were processed with a clipping path and edited for a company brochure. Removal of the background from machine photos for use in brochures, product information sheets and on the customers website. Photos are clipping to remove the background of the photo subject and then some shadowing is added to give a better finish to the image. One of the more difficult tasks is clipping the background around people. 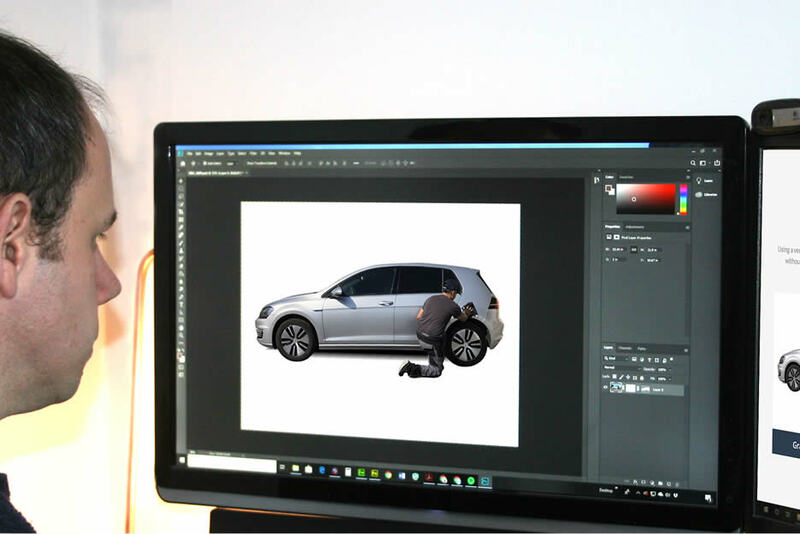 We use several techniques to accomplish a clean image clipping. What formats do you provide the images? We will provide them in the format that you require. Flattened in JPEG, TIFF and PNG or we can provide the PSD Photoshop file. Please specify when requesting a quotation. How quick is the turn around for providing images? We can normally provide the edited images with the clipping path within 24-48 hours. For customers with just a few images it will often be quicker. Very large may take longer but a delivery time will be agreed before beginning the project. Here at Photo Clipping UK we use the latest version of Adobe Photoshop. How can I send my files to you? What if I am not happy with the quality of some clipping work? If an image isn't clipped exactly as required as you would like it we then will make adjustments and reapply a clipping path to the image until it is just right. Provide details regarding the photos requiring a clipping path including the quantity, level of image detail and date required. If possible please send us a sample of files. Once a quotation is agreed, the files can be sent via FTP, or file sharing cloud providers such as Dropbox or via WeTransfer. We will begin work on processing the files sent clipping the main object or objects of each photo. They will exported in the format requested. Once the image clipping path has been added, the files will be provided the file format requested (PSD, JPEG, PNG etc) and sent back to the client via the method it was received. The project will be signed off by the client and the final invoice will be settled. Give us a call on +44 (0)1429 812170 or drop us an email, we endeavour to answer all enquiries within 4 hours on business days. Photo Clipping UK provide an image vector clipping path and image background removal service.